Making a comeback after almost six years, Honda’s new Civic flaunts some radical design changes. But is it enough to revive an ailing executive sedan segment? I distinctly remember the time when I'd stay up late at night, managing my race winnings and wondering what upgrades I should choose for my Honda Civic. Should I go for a Stage 3 clutch pack or get new dampers? Or maybe a cold air intake? Those were the pressing questions during my promising Need for Speed video game career. So, naturally, when the eighth generation Civic came to India way back in 2006, I was quite excited. Unfortunately, there was little I could do about it – I didn’t even possess a driver’s license back then. But the Civic did very well, and became quite the favourite sedan for many. It was really a premium car – in every sense of the term – with an interior unlike any other, and one that featured split driver information display and had a build quality that oozed refinement. Its overall styling was also impressive, and this added towards making it one the most desirable cars in India. The extent of its popularity can be understood by the fact that years after the 8th-gen Civic was discontinued in India, some people are still holding onto those cars. And even today when you talk to Honda employees, you can feel that they have an emotional connect with the Civic nameplate. The new Civic looks edgy and modern. And even though the India-spec model has been raised a few millimetres, it doesn’t negatively affect its overall stance. 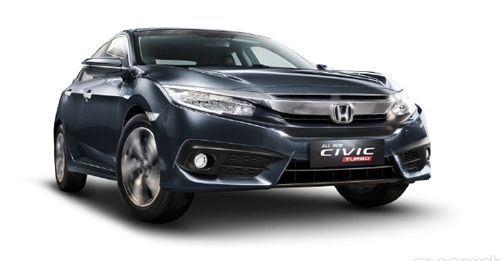 The bonnet’s raised contour on either side, along with a chrome line flowing across the front end – looking like eyebrows for the headlamps – gives the Civic a very dominating front end. In profile, it features a coupe-like roofline and a set of snazzy 17-inch wheels – the Civic comes with a full-size spare too. At the back, the roofline flows onto the C-pillar and then pours over the tail lamps – which means it has a commanding presence at the rear end too – giving the Civic an unmistakable design. The interior, though, hasn’t transformed as radically as the exterior. The dashboard is fairly simple looking and so is the driver information display with a large rev counter in the middle, not unlike the eighth-gen car. The only difference is that the digital speedometer is now housed within the rev counter. If you look closely, you’ll notice that the Civic has a very high centre tunnel running out from underneath the centre console. This makes the position of the gear lever quite sporty. However, the centre tunnel is rather high at the back too, which means that this is essentially a four-seater at best. In terms of quality, Honda has used decent plastics and switchgear, although some of the switches – like the one for the electric mirror adjustment – are borrowed from smaller Honda cars, like the Jazz, Amaze and City, making them feel not as special as they should in the Civic. One of the biggest highlights, though, is that it’s very equipment heavy – ranging from automatic brake hold and lane-watch camera to a decent touchscreen system and a wide array of safety features, it has everything that one would expect from a Civic. Coming to comfort, the seats are nice and supportive at the front, but the firewall intrudes into leg space for the front passenger. This means you may have to set the seat further back, which will inevitably eat into the legroom of the passenger sitting behind. The roofline, combined with the low floor – the door sills are quite high too – means that getting in and out requires a bit of effort too. Is it as radical to drive as it is to look at? We bagged the keys to the diesel Civic, thinking that it’s the one that’s likely to find more takers. The 1.6-litre i-DTEC four-cylinder, turbo diesel engine is the same as the one in the CR-V. In the Civic, this all-aluminium engine feels extremely refined at idle and slower speeds. But as you cross the 2,500rpm range, its diesel soundtrack begins to get more audible. Out on the road, the powertrain has noticeable turbo lag, which disappears when you get closer to 2,000rpm – which is where its 300Nm of peak torque is made. Step on the pedal, and the oil burner will rev happily towards 4,000rpm, at which point the max power of 118bhp is generated. But as the motor heads towards the redline, the engine note tends to become gradually intrusive. It is a fact that the diesel Civic falls short in terms of power in comparison to other D-segment sedans. The smoothness of the power delivery, however, is impressive, but only once you overcome the turbo lag. The first and second gears have tall ratios to ensure that you don’t have to make frequent shifts. But since turbo lag is an issue, you may have to play around with the gear lever a little more than you’d like in traffic. It becomes more evident in hilly terrain, where you really can’t drive in second gear on slower uphill sections. Back on the highway though, the Civic is easier to drive as you work through the short throw gearbox. Unfortunately, we didn’t get as much seat time in the new Civic as we would have liked, so you’ll have to wait for a more extensive drive report. In the meantime, what I can tell you is that the diesel Honda Civic will easily be the most efficient car in its segment, with an ARAI rated fuel efficiency figure of 26.8km/l. During our drive, we encountered a short, twisty section, but it was narrow and full of blind turns, which made the drive rather slow. However, I did realise that the steering wheel weighs up nicely as the speed rises, although, as expected, the feedback from the electric power steering isn’t great. That said, the car does feel like it wants to dart into corners. The body control is decent too. Honda had to extensively rework the suspension of this car for the Indian market. Since it is, essentially, a European car, it’s been raised by as much as 20mm at the front and 15mm at the rear. The end result is a staggering 171mm ground clearance. Moreover, Honda had to rework the damper and spring rates for the car’s raised stance, and in doing so they seem to have found a very nice balance – for it offers a fairly comfortable ride. The rear suspension has been set up for minimal squat under hard acceleration. And, according to Honda engineers, they went to great lengths to ensure that the suspension can dismiss our ill-designed speed breakers without unsettling the car in any way. I must say that they’ve done a brilliant job. With its purpose-built suspension setup and raised ride height, the India-spec Civic easily dismisses large speed breakers with great poise, and, unlike the last model, you don’t have to worry about scraping the underbelly. Owing to the extensive suspension overhaul for the India market, the Civic, unlike any other sedan in its range, doesn’t leave you worried every time you approach a speed breaker. And its powertrain options, although not exciting, are well suited to the Indian buyer. Let’s just hope that the notchback design works for Indian sedan buyers. It does look good, after all. X-Factor: Looks like nothing else and will grab attention everywhere it goes.